I bring you two cards. An old one (left) and a recent one (right). I'm not sure about the wordings on these. And I can't come up with real cards to use as references, so I have come to you. Are these cards well worded? The first one seems fine. I know that there is something off with the second, but I don’t know how to phrase it right. “Whenever an opponents casts the named spell” might make it feel a bit better. The first one should probably read "an artifact you control" instead of targeting for no obvious reason. 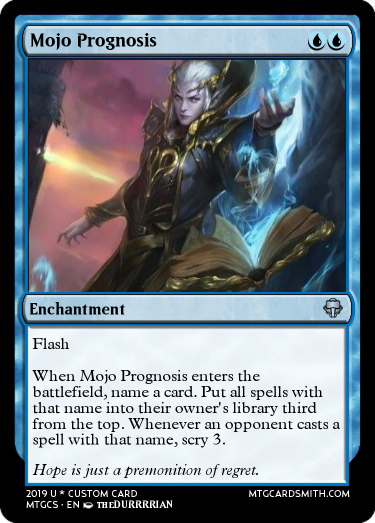 The choosing of the name on Mojo Prognosis should be a separate ability to the scrying bit (since the put-on-library bit is also an ETB then it's probably fine as part of the same ability). that name into their owners' libraries third from the top. 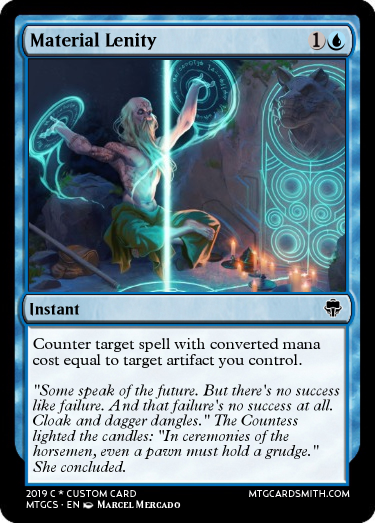 Whenever an opponent casts a spell with the chosen name, scry 3. Also I think 2 mana is a bit too cheap for this.